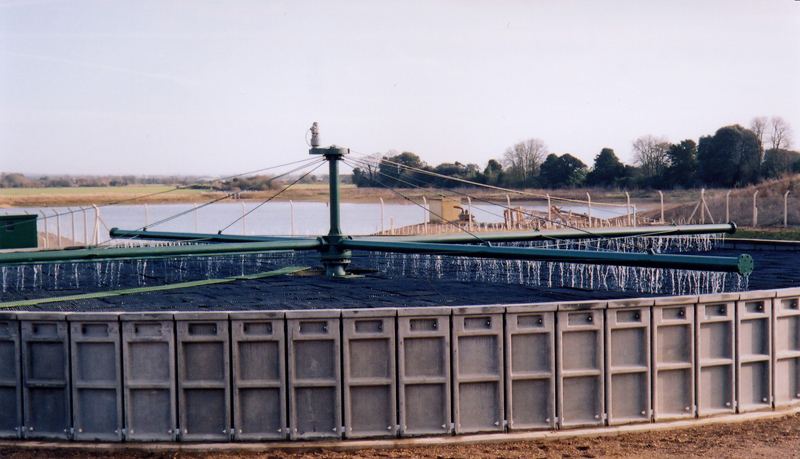 This leachate treatment plant had been planned for some time and many factors influenced the start of the project, including an Environment Agency flood alleviation scheme and the consideration of wildlife breeding periods. Locally sourced re-cycled fill was imported to reclaim an area of an adjoining gravel pit and create the site for the new plant. Sheet piling was installed and groundwater pumped out continuously to enable the works to take place in a relatively dry environment. • 25 metre diameter nitrifying filter constructed on a reinforced concrete base with pre-cast concrete circular walls. • Plastic media with a motorised sprinkler arm. • Pump station with submersible pumps controls and valve chamber. • Two reed beds each of 350 sq metres. • Perforated manholes and leachate collector system. • Twin precast culvert extension to existing feed into lake. • In addition to the major earthworks screen bunds were formed. • Infrastructure including power installation, paths and vehicle access.